Transcendent Man explores Ray Kurzweil and the Singularity. AFI Fest hails itself as the definitive survey of the year’s most significant films. I’m not sure if that makes AFI a little conceited but it certainly gives an ego boost to those films that get screened there. So I’m happy to announce that Transcendent Man, Barry Ptolemy’s documentary exploring Ray Kurzweil and his ideas about the future, will be shown on November 5 in Los Angeles at the 23rd AFI Fest. If you haven’t yet seen the trailer for the movie, check it out below. And if you’re going to be in the LA area, check out the AFI Fest website to see how you can score free tickets to the show. When we talk about the Singularity, we often mean the predicted future event wherein the growth of intelligence will exceed our current ability to comprehend it. In other words, humans (or human like beings) will be able to achieve things that would seem almost mythical to us now. Of course, when we talk about the Singularity we also tend to talk to a very small audience as it is a relatively obscure concept to most of the world. That’s why movies discussing the Singularity are big news for futurists. Once people see it on the big screen, will they care more? We know of at least four movies that are discussing the Singularity, and Transcendent Man is the first one to debut. There are over 65,000 film professionals attending AFI Fest. It’s the place where distribution deals are born…or die. If TM can do well in LA it may signal that the other Singularity movies have a chance to succeed and that people may be interested in learning more about this possible scenario of our future. I’ve been impressed with Transcendent Man since I attended its debut at the Tribeca Film Festival in April. Ptolemy deftly dodges among fans and detractors of Kurzweil’s theories while simultaneously explaining those ideas to the audience. 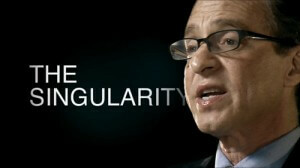 Kurzweil’s book, The Singularity is Near, is one of the definitive texts on how the exponential growth of technology will lead to a runaway phenomenon in the level of intelligence on Earth. Ptolemy’s direction allows the viewer to decide whether or not to buy into Kurweil’s predictions and spends a good time exploring the motivations behind the man. It’s a very interesting film and I encourage you to watch it. I should also note that Phillip Glass‘ music is wonderful, and I didn’t adequately praise it enough in my first review. I’m not sure if I’ll be able to attend the AFI screening, so if you live in LA or plan to be there for the week long AFI Fest (Oct 30 – Nov 7), let Singularity Hub know. We’d certainly love to have your comments on what you think of Transcendent Man. Now that AFI has decided TM is one of the year’s most significant films, it would be nice to know if people think the Singularity is one of the year’s most interesting concepts. What If the AI Revolution Is Neither Utopia nor Apocalypse, but Something in Between? When Will We Finally Achieve True Artificial Intelligence?